Spedeworth / Incarace would like to make everyone aware of the following fixture changes taking place in East Anglia this weekend (8th & 9th September 2018). •	Great Yarmouth Stadium on Sunday 9th September is CANCELLED! This meeting is no longer running this weekend due to the stadiums request to remove the fixture. We would like to thank all the drivers who had booked-in to attend the event for any inconvenience this may cause. 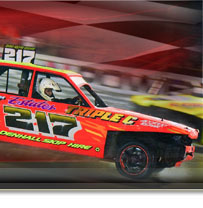 •	The Bangers which were scheduled to race at Great Yarmouth will now race on Saturday night (8th September) at Foxhall Heath Stadium, Ipswich for the East Anglian Championship making this meeting a rare four formula event at the venue. The attendance points towards the Banger World Qualifying Chart will now be added to this meeting from the cancelled Great Yarmouth event. Once again, we thank you in advance for everyone’s understanding with these changes and look forward to seeing everyone around the raceways soon.